NEW! 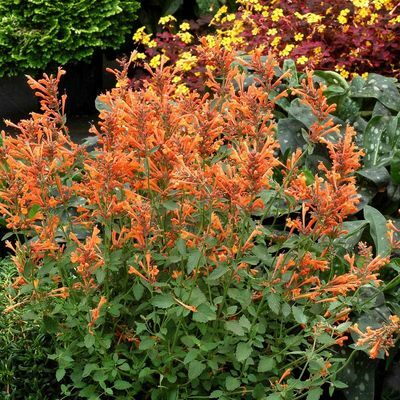 'Coral' Warm, coral colored plumes are dense with a sweet honey-mint scent. NEW! 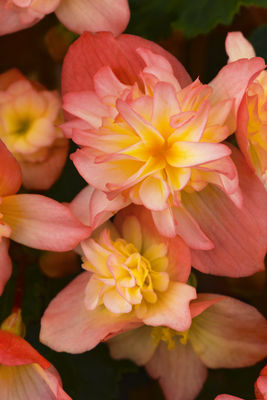 'Mandarin' Cheery, bright orange plumes that last and last. This plant has a “neat as a pin” appearance for many months. NEW! 'Yellow' Large, dense spikes of yellow flowers adorn this wonderfully compact Agastache. 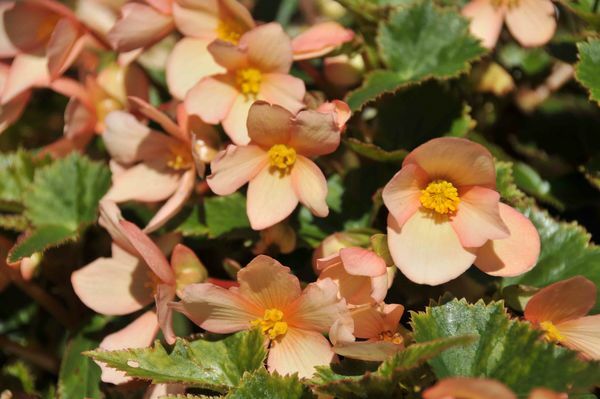 BEGONIA A popular bedding plant prized for its beautiful flowers and leaves, its wide variety of color and ability to thrive easily. 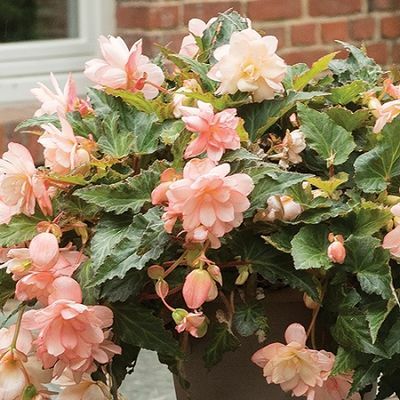 Here at Andrews you will find begonias in some of our hanging baskets, they do very well in shade and part shade. It is important to grow them in a good soil with plenty of good drainage, and a low Ph. NEW! 'Fragrant Falls Peach' The fully double blooms are highly perfumed and remain fragrant whatever the weather. 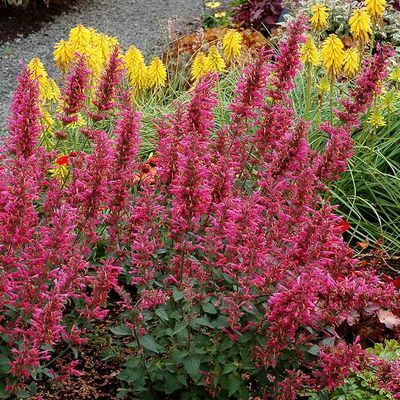 Long lasting color, flowering throughout summer and well into autumn. Semi-trailing. H 12", spread 12"
NEW! 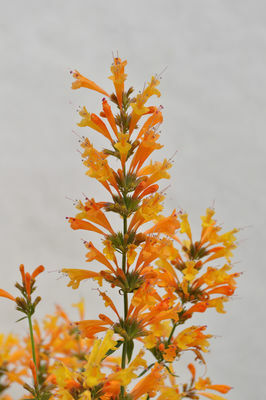 'Iconia Unbelievable Lucky Strike' Lucky Strike, semi-double blooms are a blend of orange and yellow, dark blue-green leaves are narrow and pointed, framing the flowers nicely. Upright habit. NEW! 'Iconia Unbelievable Miss Montreal' The large 3" blooms are fully double in shades of creamy-white edged with pink, well-branched and prolific flowering from spring through fall. 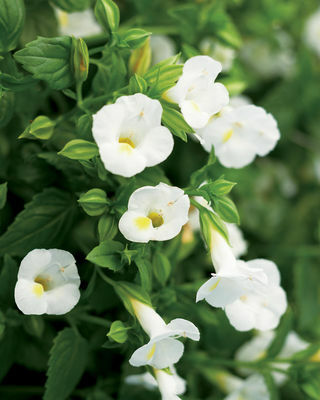 The plant has a mounded but semi-trailing habit so it grows well in hanging baskets or large containers. H 10-14" x 12" W.
NEW! 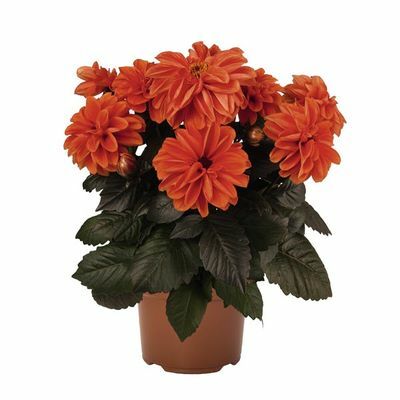 portifino collection The dark foliage of this series contrast nicely with the double blossoms of 'Sunrise' with yellow centers and bright orange outer petals and the double blossoms of 'Hot Orange'. Semi-upright plants are well branched plants proven to perform. H 12-20"
NEW! 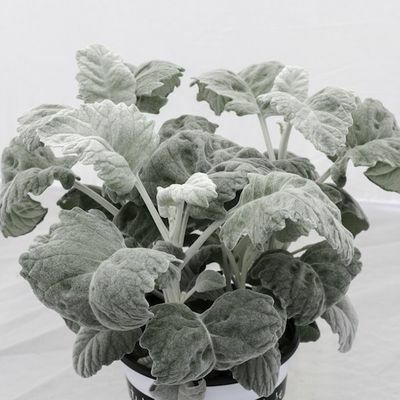 'Dibs Cherry Mint' Attractive serrated heart shaped leaves are rose with grayish green edges and a hint of black. H 10-12"
NEW! 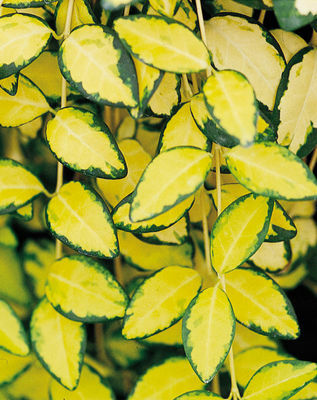 'Magic Colors Zumba' Vibrant colored leaves, green with deep green to black veins adds interest to shade combinations. NEW! 'Red Bull' The leaves are a bright metallic red. The leaf margin is wavy and will sometimes be a little darker than the rest of the leaf. 8"
NEW! 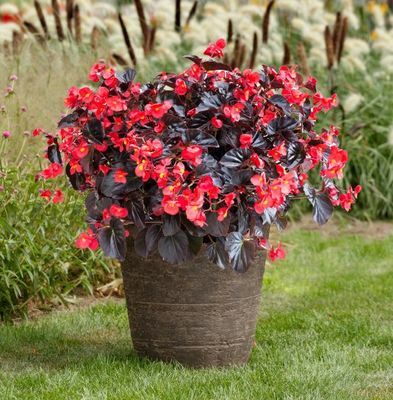 spring fling series Elegant color for patio pots with its dark foliage and tight, upright habit. Offered are 'Buttercup' and 'Pink Tulip'. NEW! waterfall series Encanto Orange, Encanto Pink and Encanto Red are well-branching trailing plants, very tolerant of bright locations. Full sun to part shade. NEW! 'Viking XL Red on Chocolate' 2019 AAS Flower Winner. 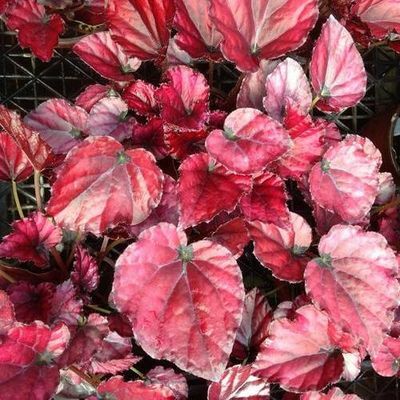 A brand new begonia with large, uniquely colored dark leaves that remain intense throughout the season. 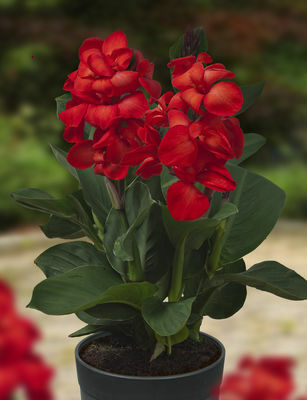 Covered with vibrant red flowers, this plant retains its shape well and does not become rangy. 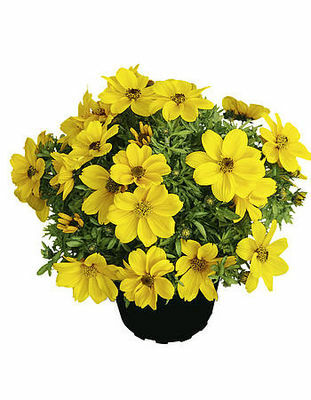 H 28-34"
BIDENS A vigorous plant with finely cut foliage. This real treasure is covered with enchanting brilliant flowers from spring until a heavy frost. 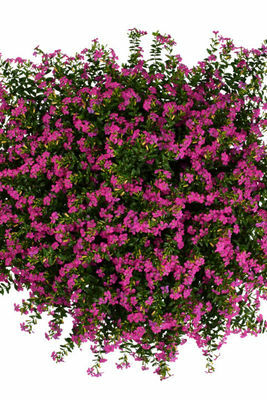 An ideal plant for weaving color amongst others in planters or hanging baskets. Full to part sun, average soil. NEW! 'Bee Bold' Upright habit with large red and yellow bicolor blossoms. H 14-20"
NEW! 'Bee Happy' Vigorous, upright, Bee Happy produces new bi-color flowers to grow over the top of used-up flower heads, so it always looks fresh and colorful. H 10-14"
NEW! 'Pop Star' An extremely compact form with a mounding habit. 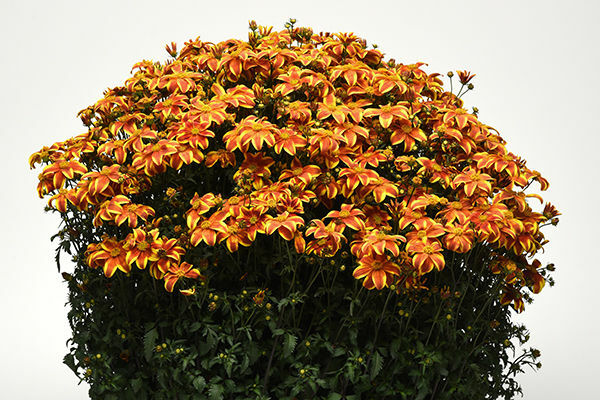 Its flowers, which are larger than most bidens varieties, lie directly above foliage. NEW! 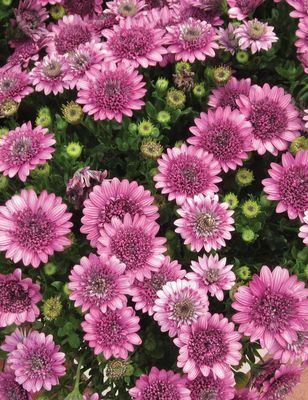 'Pretty in Pink' A compact variety decorated with an abundance of pink flowers with purple stripes. NEW! 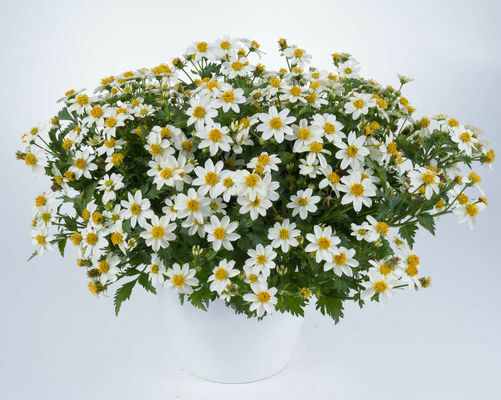 'White Delight' 'White Delight' offers white daisy-shaped flowers with a yellow center. Grows 14 inches tall and wide. 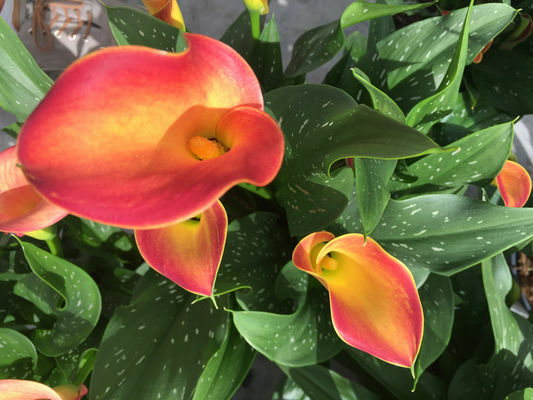 CALLA LILY Calla lilies are not true lilies but are clump forming plants with large arrow shaped leaves. 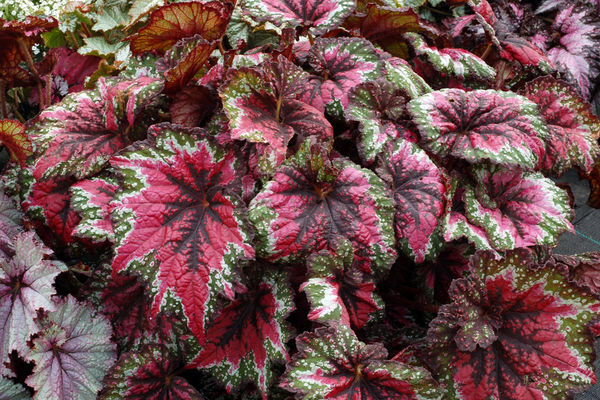 They are used as both houseplants and seasonal outdoor bedding plants. Grow best in full sun. NEW! 'Morning Queen' Orange flowers flamed with yellow. Dark green foliage with silvery spots. H 14-22"
NEW! 'Crystal Clear' Pure white blooms and clear green lanceolate foliage. H 14-22"
NEW! 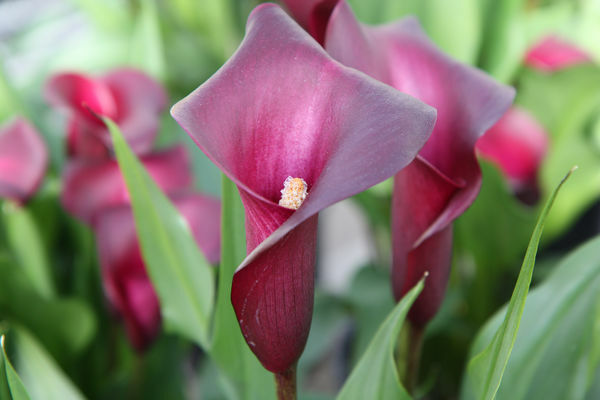 'Night Life' This productive variety produces numerous dark purple, almost black flowers on green leaves. 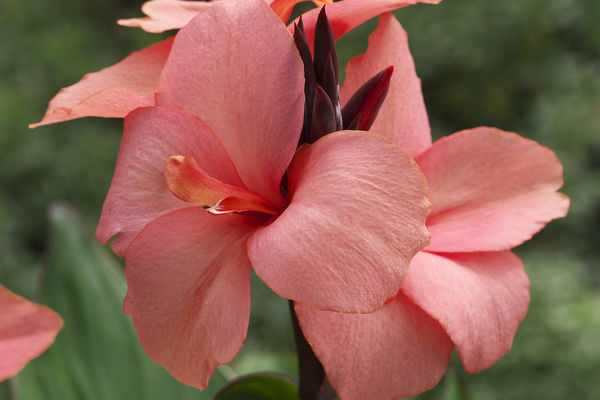 H 12-18"
CANNA Big, tropical plants with bold flowers and richly colored foliage. These definitely make a statement and add a sense of lushness to your garden. They need lots of water, sun, and heat. They work well in containers. Dig up the rhizomes in the fall, store, and replant in spring. NEW! 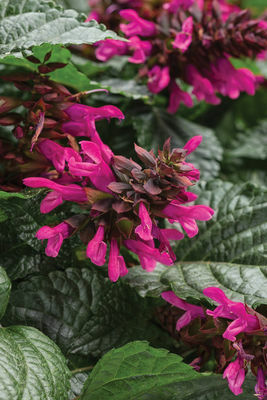 'Cabana Flirtini' Compact, growing from 2' to 3' and having dark dusky purple foliage which sets off the rich watermelon pink blooms. NEW! 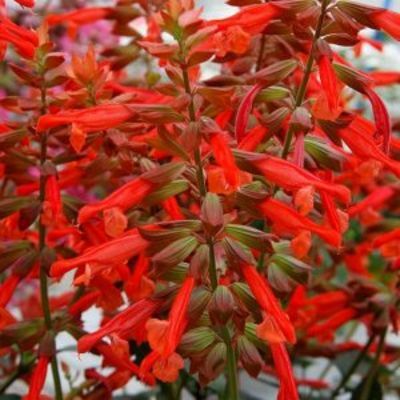 'Cannasol Happy Carmen' Bright red self cleaning flowers green foliage. H 20-24". Perfect size for containers! NEW! 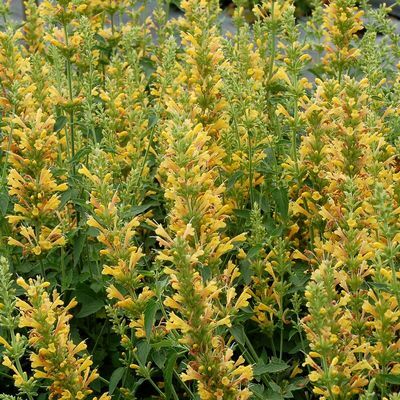 'Cannasol Happy Emily' Soft yellow flowers with lovely orange marks and dark green foliage. Bloom height 20-24". Perfect size for containers! NEW! 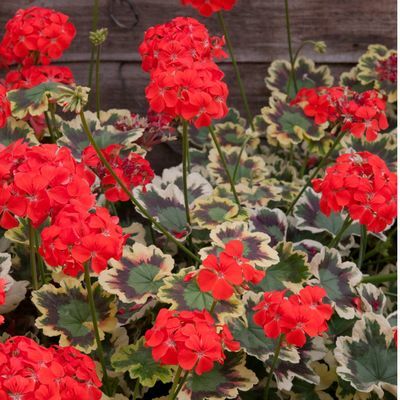 cannova bronze leaf series 'Bronze Orange' and 'Bronze Scarlet', growing only to about 3 feet, with burgundy leaves and vivid blooms. Perfect for containers! NEW! generalis 'Cannova Series' Striking foliage contrasts with the large flowers, making them a great option for mixed combination at 3-4' tall. Two green leaf varieties offered. 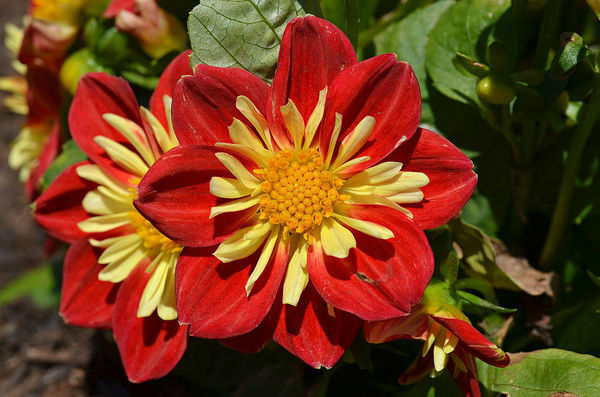 'Mango', with orange pink blooms, and 'Red Flame', red blooms with yellow edges. 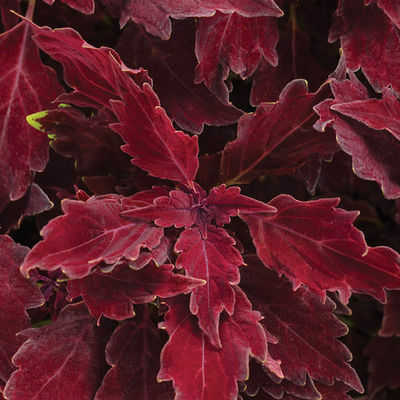 Two bronze leaf varieties offered, 'Orange' and 'Scarlet'. NEW! 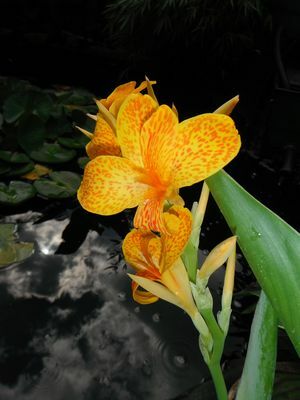 'Island Tenerife' Growing to 3 feet, Tenerife has green foliage and bright yellow flowers generously spotted and speckled with orange. NEW! 'Toucan Coral' Blooming early and continuously all summer with soft coral pink flowers and mid-green leaves. H 30-48"
NEW! 'First Flame Purple' Well-branched plants produce loads of non-fading, brightly colored purple plumes. 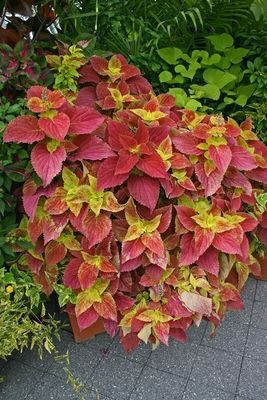 H 10-14"
COLEUS (aka Solenostemon) Brightly colored foliage plants to brighten partial shade. Great accent plants in the ground or in mixed containers. 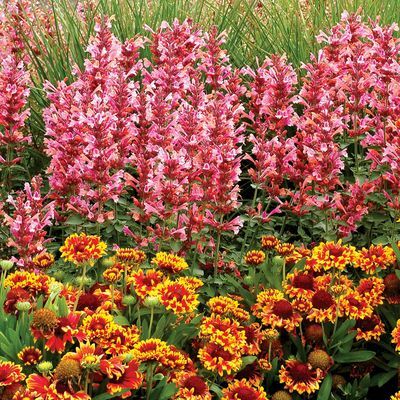 Most of these varieties can go in full sun or full shade or anywhere in between. NEW! 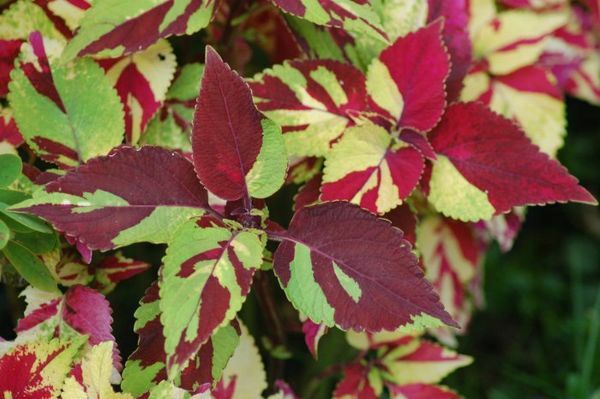 'Finger Paint' Leaves are a blast of bright red, purple, green, and yellow. May not show full color in early spring. Eye catching! Part sun to shade. H 14-18"
NEW! 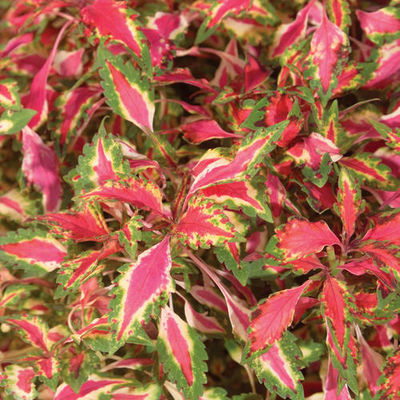 'Glennis' Sunny yellow leaves are edged in a mottled pink, green, and burgundy. Sun or Shade, H 18-28". NEW! 'Pinkplosion' 'Pinkplosion’ has a green leaf with a pink and cream splash in the center. The serrated edge is thinly penciled in purple. Best in light shade but will tolerate full sun. H 14-28"
NEW! 'Rediculous' Forms a robust, colorful mound of intense red; its rediculous! Sun to shade tolerant. H 20-24". A new and improved replacement for no longer available 'Big Red Judy'. NEW! 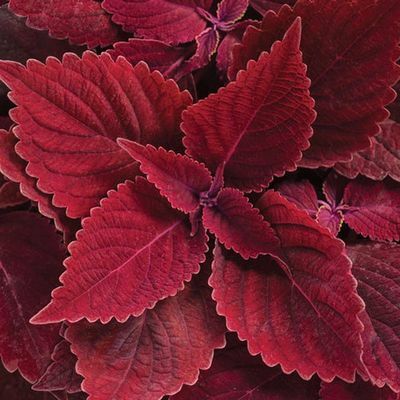 'Royale Cherry Brandy' This jazzy new Coleus for sun and shade features red leaves, forming a very well-branched plant that works well in landscapes and containers. H 16-24"
NEW! 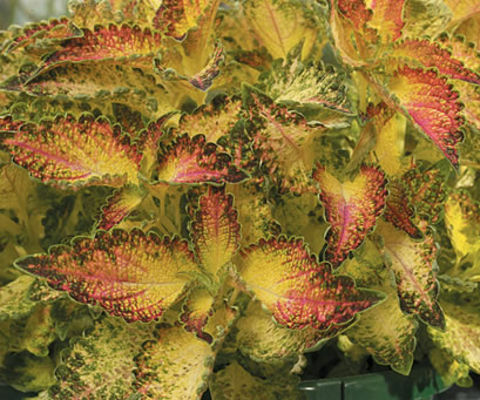 'Wildfire Flash' This showy coleus has a tight habit with leaves that are both creamy and lacy. 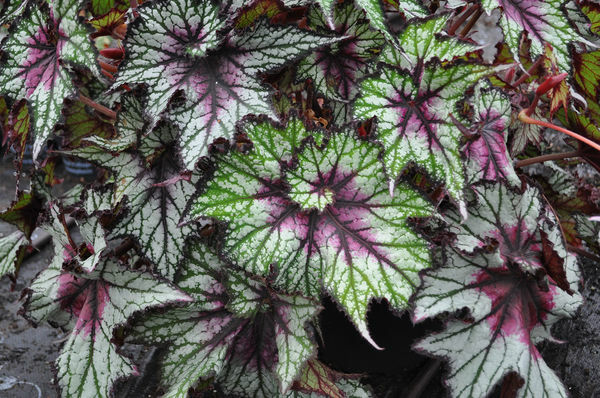 Leaves are also center-striped with magenta and have an elegant emerald edge. A compact spreader, H 8" x 24" W. Part to full shade. NEW! 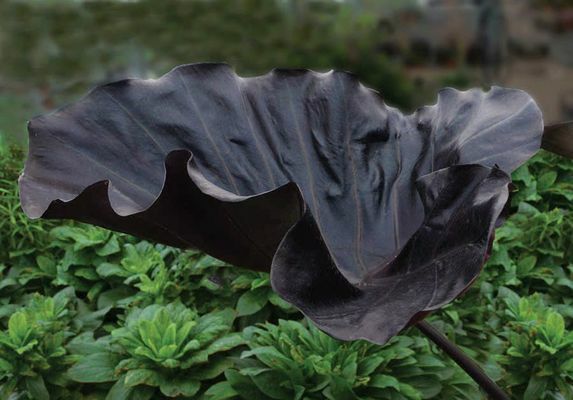 'Black Goblet' An amazing new Colocasia growing to about 5' tall and wide, with large (2' x 3') crinkled, bowl shaped leaves of deep glistening black. NEW! 'Maui Gold' Textured chartreuse foliage held on ivory white stems. Foliage does not burn in high temperatures or full sun. H 48" x 36”. 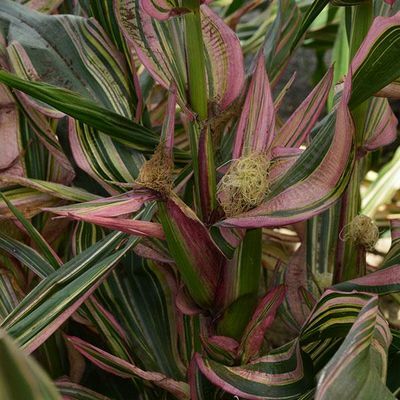 CORDYLINE Long sword-shaped leaves, exceptional plant to use for height and texture in container plantings. Sun to part shade. Bring indoors to overwinter. NEW! 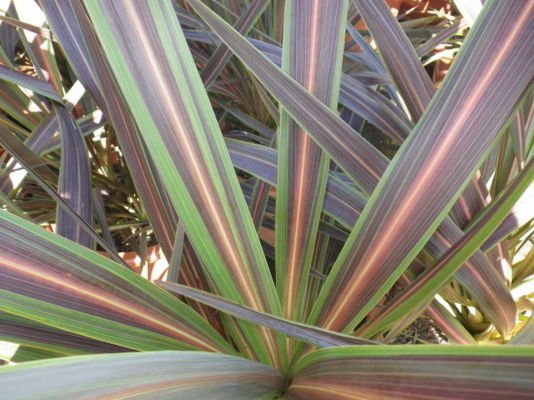 'Cherry Cordial' This vibrant Cordyline features deep mahogany coloration striated with crimson, mauve and pea green. Grows to 18" in one season. NEW! 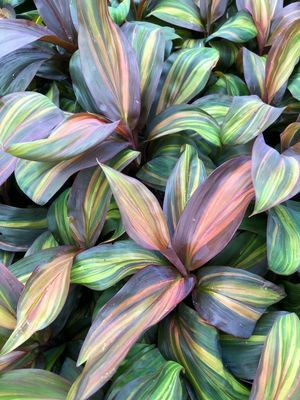 'Electric Star' Bright green and chocolate striped foliage. NEW! 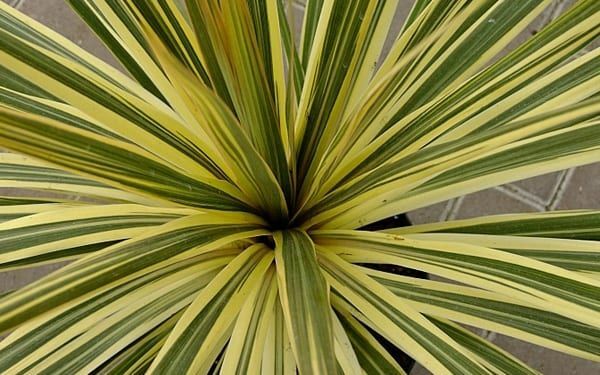 'Torbay Dazzler' Striking variety with green and cream striped sword-like leaves. 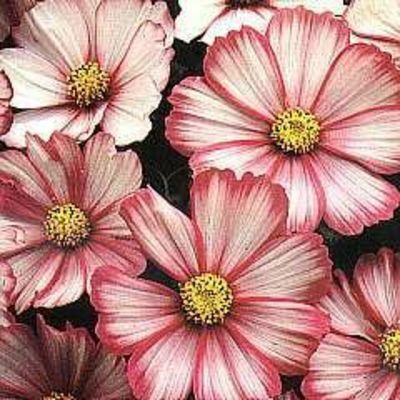 COSMOS Old-fashioned bloomers create airy stands of cheerful flowers. Ideal for butterfly gardens and cottage gardens. Thrives in poor, infertile soil. Over fertilizing results in lots of foliage but few flowers. Full sun. NEW! 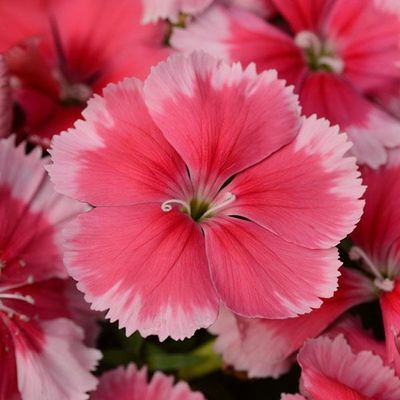 'Peppermint Twist' Huge 6" snow white flowers edged with crimson, early flowering. H 24"
CUPHEA Very heat tolerant plants, originating from South America, which form bushy mounds smothered in dainty colorful flowers. Once a customer discovers that these plants bloom non stop in hot weather even with a little neglect, they are always back for more the next season. Full to part sun. NEW! 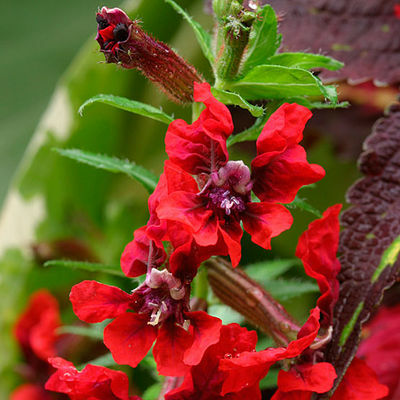 llavea 'Flamenco Samba' (Bat faced cuphea) Large, rich, burgundy flowers bloom continuously throughout the season. Deadheading not necessary. 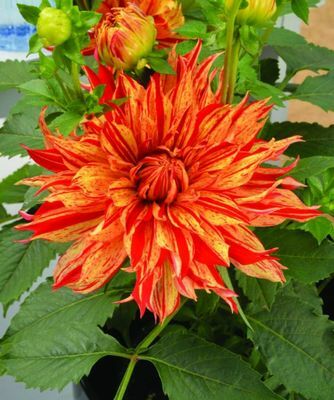 H 12-20"
DAHLIA pinnata Large, brilliantly colored blooms overlook a mound of leathery green leaves. A good bedding plant for a very sunny location. Attracts butterflies. NEW! 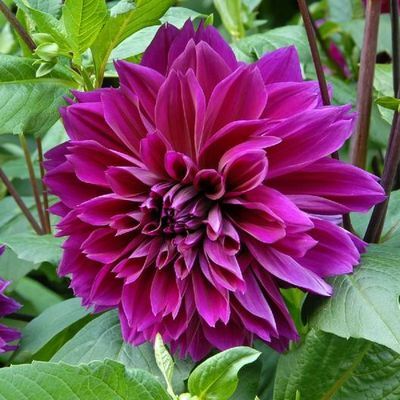 city lights series Dark-leaved dahlias with bold colored blooms last all season long. Offered in Purple, Red and Yellow. H 16-18"
NEW! 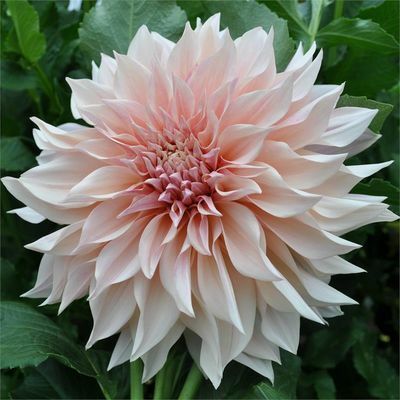 'Cafe au Lait' Full double, cream-peachy, huge size flowers (up to 10"). H 40"
NEW! 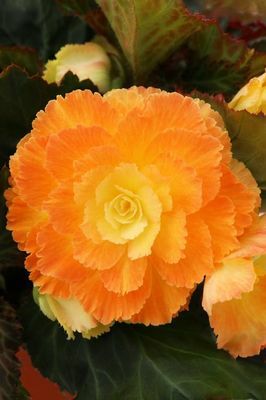 'Mr Sandman' Huge, soft orange twisted petals edged with darker peach orange. H 36"
NEW! 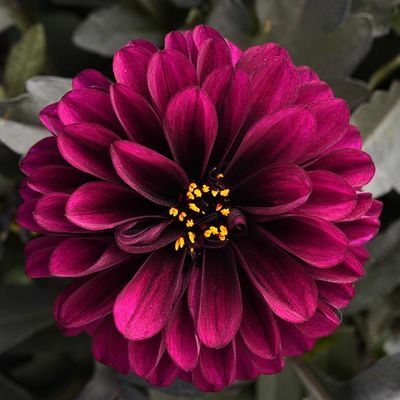 'Thomas Edison' Full, double (up to 10"), deep purple flowers with dark velvet center. H 40"
NEW! 'Painter Sunfire' Extra large, orange pink flowers splashed with red and white on strong, upright stems. H 24"
NEW! 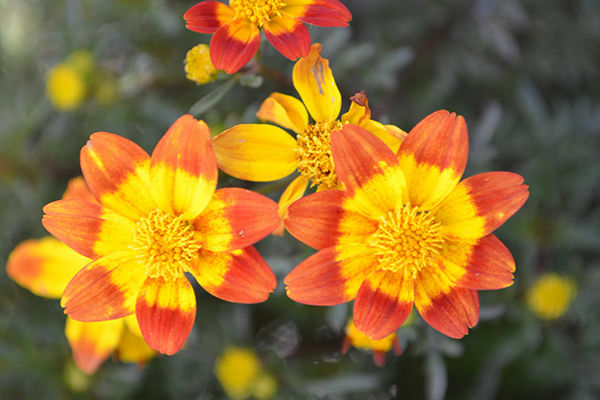 'Sisterstar Scarlet with Yellow' Showy, semi-double blooms with deep scarlet petals covered in cheerful golden yellow centers. Compact, non-stop bloomers. H 16-18"
NEW! 'Temptation Orange' The intense dark foliage makes the color of the clear orange flowers really pop out. 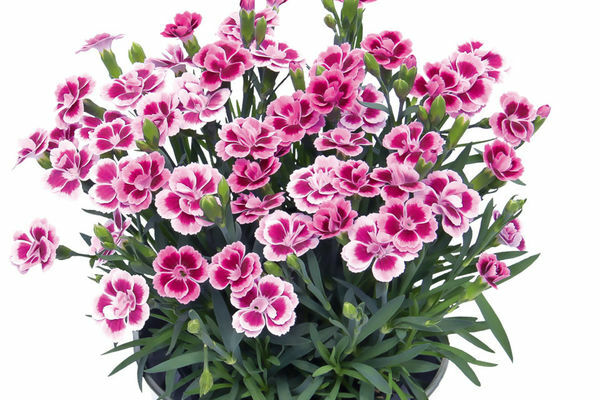 H 12-24"
DIANTHUS A family of plants which includes carnations and are characterized by the spicy fragrance the blooms emit. Dianthus plants may be found as a hardy annual, biennial or perennial. Sun, well-drained soil. NEW! caryophyllus 'Pink Kisses' Stiff stems bearing strongly fragrant, double, pink flowers with a prominent reddish-pink mark at the center of each petal. H 12-16"
NEW! chinensis 'Corona Strawberry' These large blooming flowers have shades of coral and salmon varying from solids to bicolors to picotees. H 8-10"
NEW! ERYSIUM linifolium 'Sunstrung BiColor Purple' (Wallflower) Profuse clusters of fragrant bi-colored flowers that will flower all through the summer, exceptionally heat tolerant. Use in mixed containers and in the garden. FERNS Fabulous foliage components integral to your gardens or containers; within this selection of ferns you’ll find the addition you need: either lacy, delicate, small, bold, or large. All can be overwintered as house plants. They need lots of humidity, indirect light and should never dry out. FUCHSIA Shade lovers with intricate blossoms. The blooms consist of upward arching sepals (outer petals) and single or double corollas (inner petals) from which dangle long stamens. Each bloom looks like a dancing fairy. All prefer a cool, moist spot. 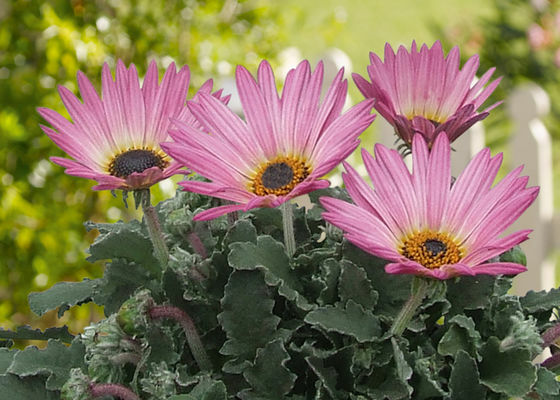 Keep well-watered and fertilized during the heat of summer. Part shade to shade, though some listed like more sun and will say so. NEW! bella series Compact, upright and bushy . 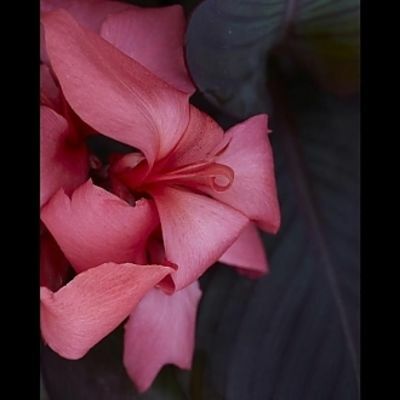 Offered are 'Evita', flowers with deep pink sepals and single, pink-veined, white corollas, 'Mariska', flowers with pink sepals and single, purple to magenta corollas and 'Soilda', deep reddish-pink sepals and single, deep purple corollas. 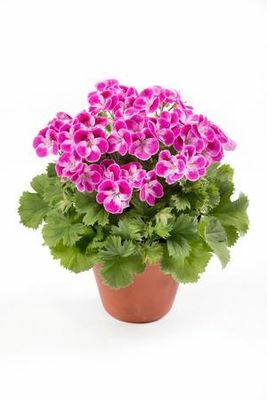 GERANIUMS pelargonium Long standing favorite annuals with a plethora of uses. Full to part sun, average soil. NEW! 'First Yellow' Presenting the first true yellow geranium ever! A breakthrough in the land of geraniums. The stunning yellow double-blossomed beauties flower gloriously all summer long. H 12-15"
NEW! 'Mrs. Pollack' A fantastic variegated leaved Geranium. 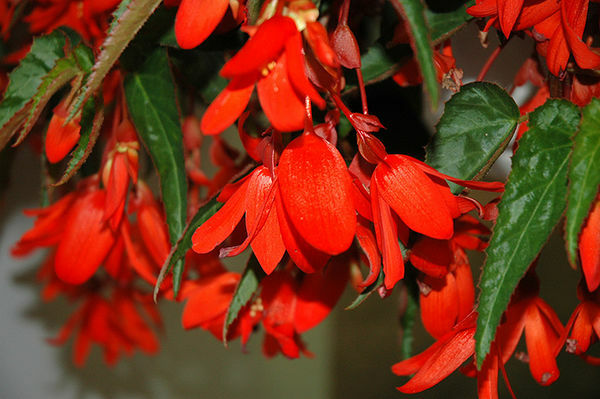 The bright, attractive foliage consists of tri-colored leaves of yellow, red and green with orange-red flowers. NEW! 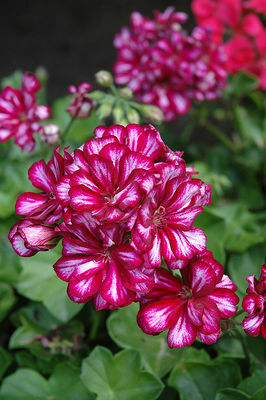 'Great Balls of Fire Burgundy Blaze' Bold clusters of lightly-scented burgundy flowers with white streaks at the ends of the stems from late spring to early fall. NEW! regal 'Pinkerbell' (Martha Washington) Pinkerbell is a stunning new regal hybrid with a more compact habit than other lines but full of bi-color pink and white flowers that come nonstop throughout the summer months. Heat tolerant and fragrant. 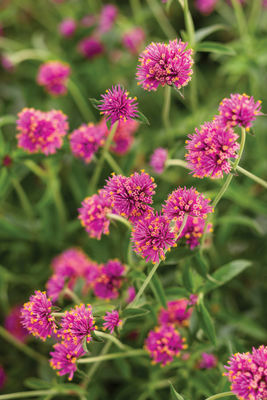 H 12-18"
GOMPHRENA Globe Amaranth has long been treasured in everlasting arrangements with its papery, clover-like blooms. Likes well-drained, even dry soil and full sun. NEW! 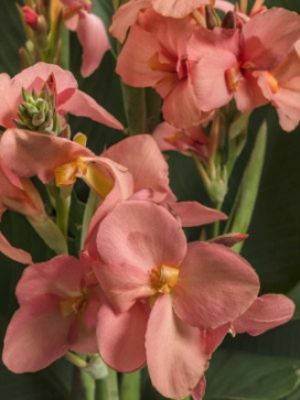 pulchella 'Truffula Pink' Flowers are held on graceful, arching stems above narrow leaves. The blossoms are hot pink orbs tipped in tangerine. H 22-28"
LOBELIA erinus A delicate looking little plant ideal for partial to full shade situations. Dainty, spurred flowers absolutely conceal the foliage. There are both mounding and trailing types. Resent drying out. MARGUERITE DAISY argyranthemum frutescens Cheerful daisies smother compact shrubby plants with long, narrow, finely divided foliage. Most bloom best in cool weather. Full to part sun, average soil. NEW! 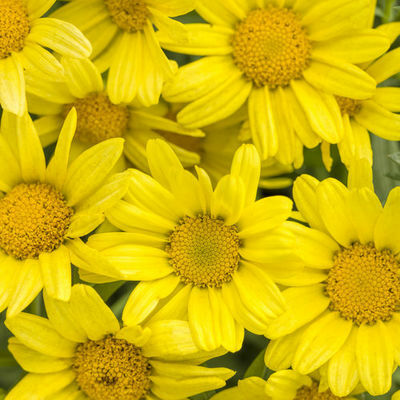 'Golden Butterfly' This large golden yellow daisy has flowers that thoroughly cover the plant all summer. Continuous Bloom or Rebloomer. 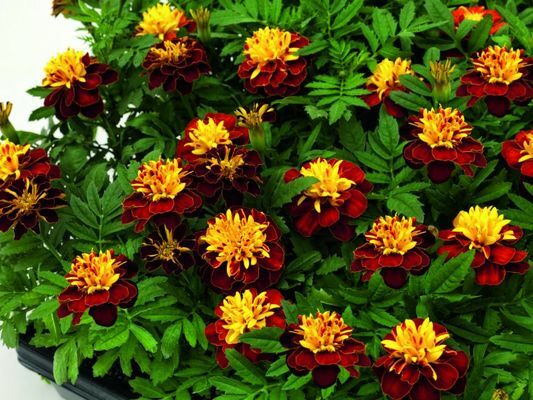 H 18-28"
MARIGOLDS tagetes Cheerful, bright flowers which bloom profusely all summer, and a tough, vigorous nature are the attributes which have made Marigolds one of the most popular bedding plants of all time. Full to part sun, average soil. NEW! 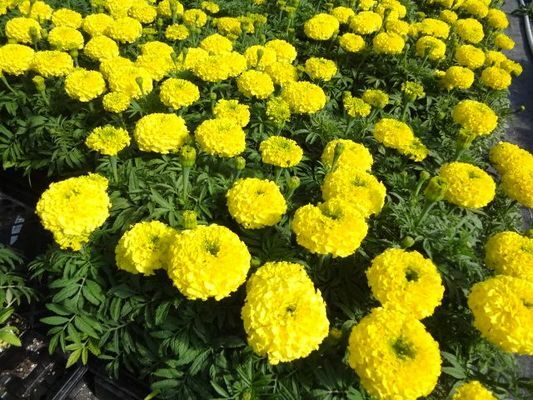 'Marvel Yellow' Large yellow flowers (3-4") on stems that will grow to 18". NEW! 'Super Hero Spry' 2018 AAS Flower Winner. Lovely, 2" blooms of dark maroon lower petals and golden yellow upper petals. Earlier to bloom and no deadheading required. H 10-12"
NASTURTIUM tropaeolum majus These brightly colored flowers are an essential element of the cottage garden. 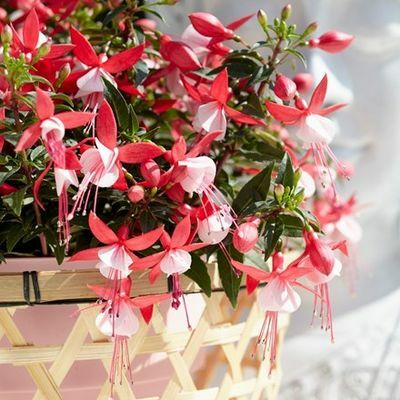 These cheerful, trailing plants are delightful spilling over walkways and containers. Funnel-shaped flowers make a colorful, peppery addition to salads. All form cascading mounds, 10-12" high, then trailing. Best in full sun to light shade and average to moist soil. NEW! 'Baby Rose' 2019 AAS Winner. 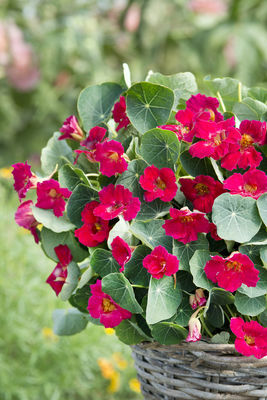 This new variety is a breakthrough in nasturtium breeding with its very compact habit and much smaller, darker leaves and stunning, very dark, 2" rose prolific flowers. 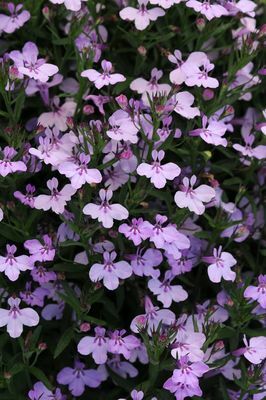 20"
NEMESIA fruticans Small, airy, snapdragon-like flowers dangle above glossy green foliage. Full sun to part sun, average soil. 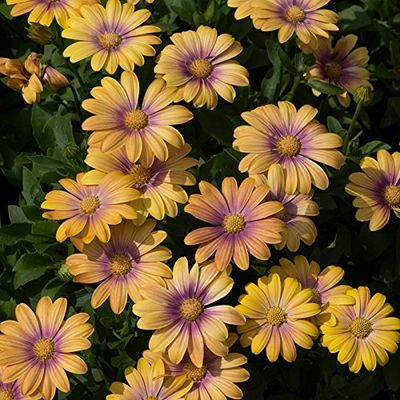 OSTEOSPERMUM A cool weather annual with showy, daisy-like flowers. Plants flower in spring and fall, but dislike summer’s extreme heat. Will give their best performance if deadheaded regularly. Always a favorite here at Andrew’s. Full to part sun, average soil. H 8-14"
NEW! 4-d series This new 4-D Series is a whole new dimension of flowers! Its beautiful true double blooms stay open all day and night. An eye catcher! Offered are 'Lemon Ice', 'Pink', and 'Purple' . NEW! 'Blushing Beauty' Golden yellow petals with a sugar pink base. Plants form neat mounds which become smothered in flowers throughout summer and well into autumn. H 10-14"
NEW! PENSTEMON 'Pentastic Rose' Beautiful, bell-shaped, rose/white blooms are densely packed above the compact, tidy foliage from June to October. Attractive to bees, slug resistant, sun or part shade. 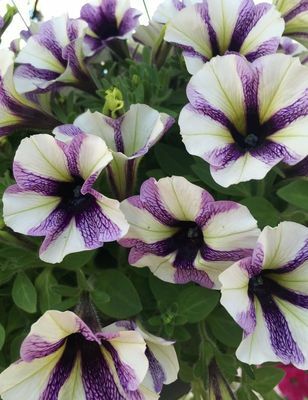 H 8-12"
PETUNIA Blooming in almost any color imaginable, Petunias deserve a place in everyone’s garden. 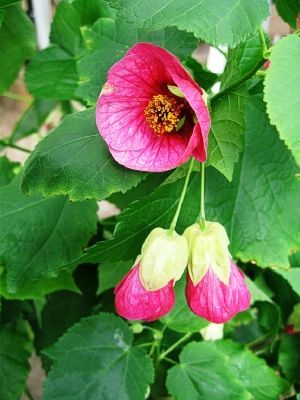 They are long blooming, versatile plants that look nice in both containers and in borders. Full to part sun. NEW! 'Potunia Blueberry Muffin' This new variety of petunia is a unique breed boasting a bubble-like, round habit. A pretty pastel variety in shades of purple, cream and yellow. Mounding and full of flowers. 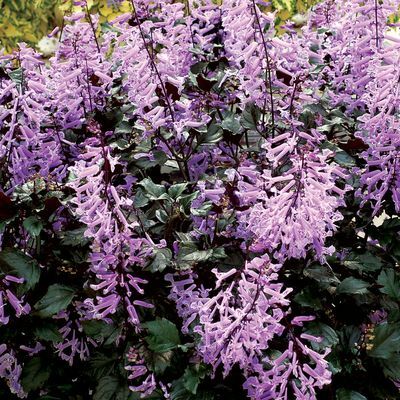 H 6-10", spread 10-12"
PLECTRANTHUS We can’t say enough about Plectranthus. 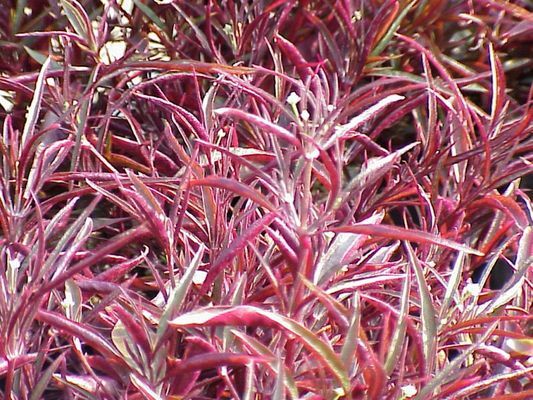 Its coloring, shape, and habit make it one of the finest accent plants we have ever grown. Sun or shade. NEW! 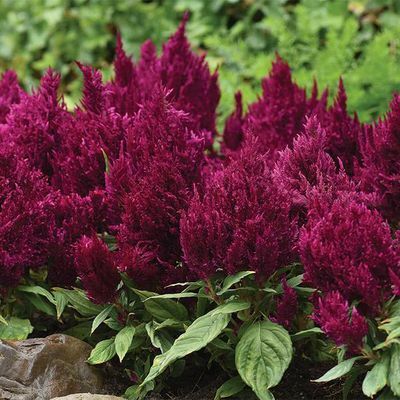 'Velvet Elvis' Plush, velvety foliage is deep green with a vibrant purple back. Huge flower spikes are twice the size of Mona Lavender and create an amazing floral effect that lasts for months. Blooms September/October. 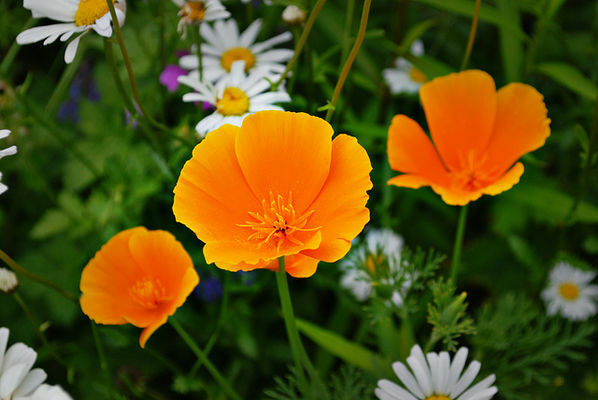 H 28-32"
POPPIES Showy, colorful blooms with papery petals dance upon wiry stems throughout most of the summer. Attractive seed pods add interest in the garden or in arrangements. Plant early in the season while soil is moist and cool. Once established, poppies thrive in hot, sunny, dry locations. NEW! 'Orange King' 'Orange King' is a tall, tangerine Californian poppy with delicate, silvery foliage. Perfect for edging paths, giving a naturalistic feel to any garden. It will self-sow. 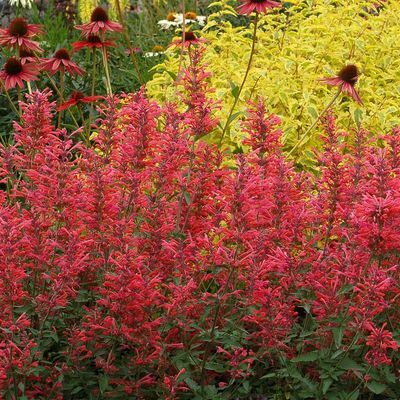 H 18"
SALVIA A decorative bedding plant grown for its showy flower spikes flaunting an astonishing array of colors. Upright branching habit. Attractive to hummingbirds and butterflies. Full sun and amply moist, average garden soil. NEW! 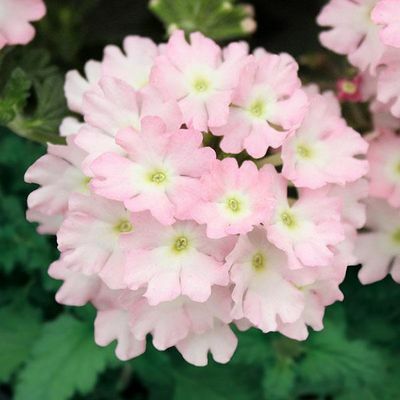 skyscraper series Brand new for 2019, these beautiful plants are compact, easy to grow in the PART SHADE and full of flowers all season long. They make outstanding container plants as well. 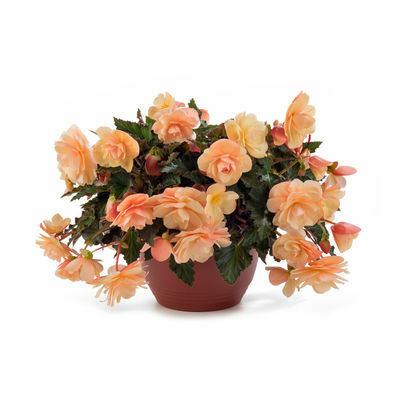 H 14-28" x 10-16" W. Offered in 'Orange' light orange with golden orange bracts and 'Pink', pink flowers with a “rose gold” calyx. NEW! x. 'Rockin Fuschia' Gorgeous flower spikes of fuschia colored flowers surrounded by near black calyses with a well-branching bushy habit. Great in full sun to part shade. 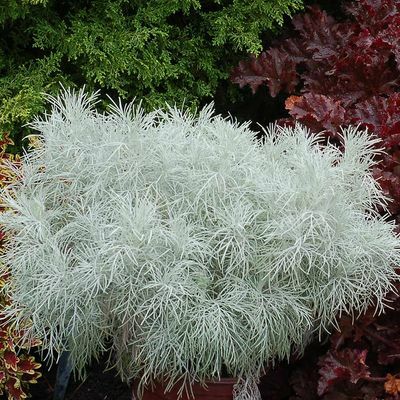 H 24-36"
SENECIO candicans Traditional silver foliage accent plants that endure hot, dry conditions. Serrated silver leaves add texture and contrast in the garden. Cold hardy annuals last late in the fall. Full to part sun, average soil. NEW! 'Angel Wings' You won’t be able to resist touching the 5" long, heart-shaped, velvety leaves of dazzling matte silver with toothy edges. 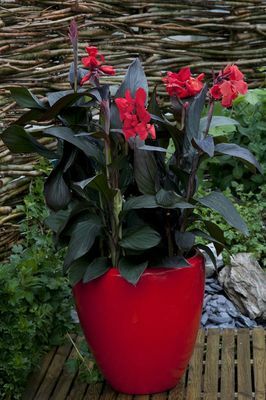 Easy to grow, it is an exciting design option for mixed containers or borders. Will grow 8-16". NEW! 'Crushed Velvet' Adding a plush look to the landscape with its velvety silver leaves that arch to give a vase shape habit. Will grow 12 to 16" with a 6 to 8" spread. 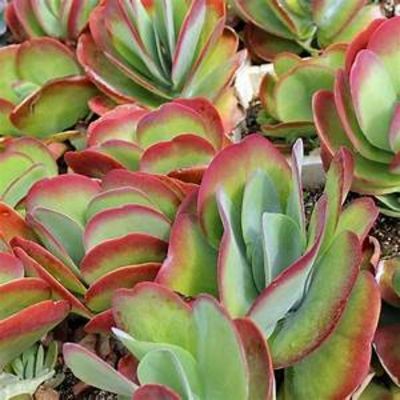 SUCCULENTS This group of easy to grow, forgiving plants are bound to enchant you with their unusual colors, textures, growing habits, and extraordinary flowers. 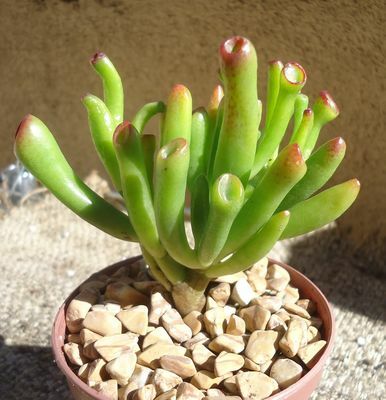 Succulents prefer smaller pots, as too much root room can deplete their energy with only root growth. Keep them snug and they’ll keep you happy; mixed containers of succulents create magical displays. Grow in full sun and keep on the dry side. NEW! ovata 'Gollum' A mutated form of Jade. Tubular leaves have red tinged suction cup like tips. Star shaped white flowers. H over 12"
NEW! 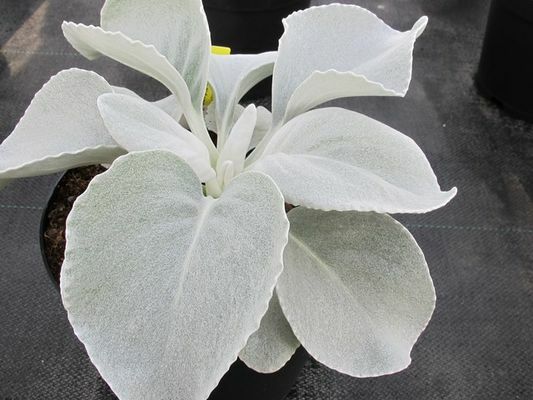 KALANCHOE laciae (Paddle Plant) Likened to clam shells because of the shape of the thick 4-6" long by 2-5" wide rounded leaves. The leaves are covered with a gray bloom and the leaf margin takes on a reddish hue during cooler winter months if grown in bright light otherwise the leaves remain uniformly green. NEW! 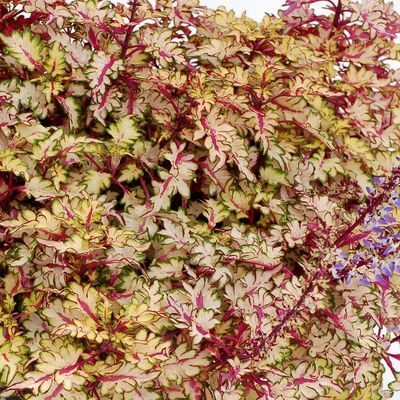 TOLMIEA 'Cool Gold' (Golden Piggy Back Plant) Fun gold foliage that does not splotch or revert in color, making it ideal as a bright spot for shade borders or mixed beds, producing small maroon flowers for added interest. Fast-growing, clumping habit, H 12" X 14" W.
TORENIA fournieri (Wishbone Flower) A great shade performer! 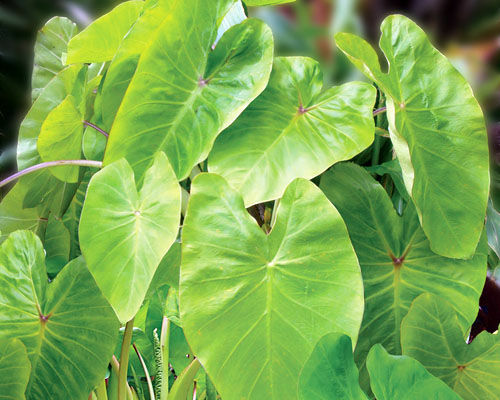 The Wishbone Flower is an exotic looking leafy plant with small, dark green leaves and a plethora of lipped blooms, each with a wishbone-shaped marking. Flowers are reminiscent of snapdragon florets. Low maintenance plants that are self cleaning; that's right, no deadheading! 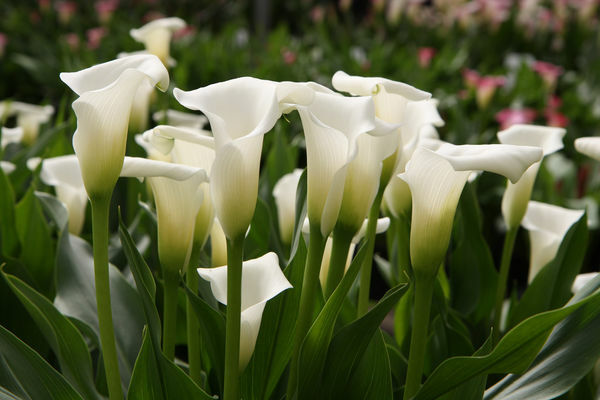 Does best in consistently moist, well-drained soil and partial to full shade. NEW! 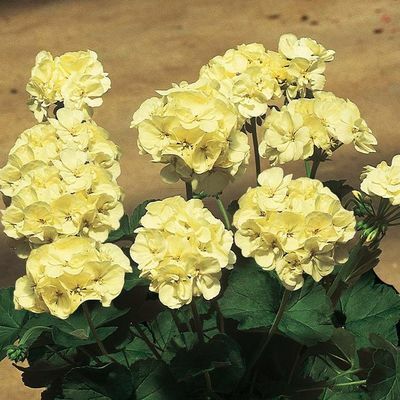 'Catalina White Linen' Crisp white with yellow throat. H 8-16"
NEW! TRIFOLIUM 4 luck series Trifoliums trailing and spreading habit plays nicely with other plants and provides a fun, trailing texture in your mixed containers. 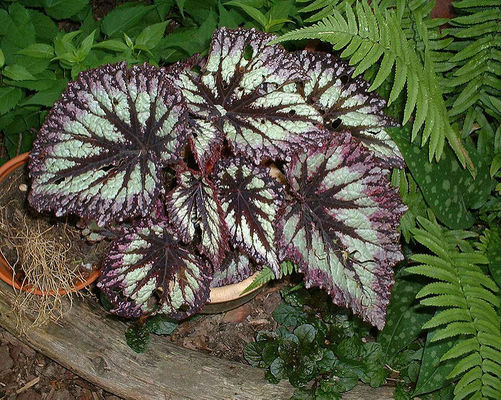 Its "shamrock" foliage has bold patterns. Plants grow energetically in sun and shade. 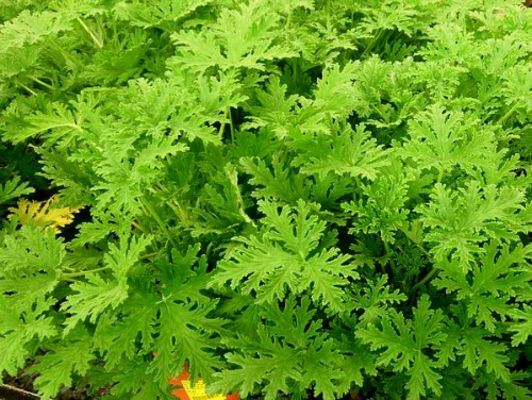 Offered as 'Cocomint' and 'Green Glow". H 3-5" x 8-10" spread. VERBENA A large genus of plants with bristly foliage, square stems and dense, flat-topped clusters of small flowers. Will bloom all summer if deadheaded and fertilized regularly. Attracts butterflies. Full sun, average soil. NEW! 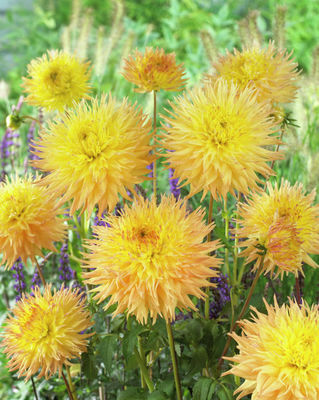 firehouse series Blooms long into Summer, and won’t cycle out of color in your garden. Very heat tolerant and has excellent mildew resistance. The flower season is extends from late spring into autumn. Offered in a full range of colors. Light Pink w/Eye, Dark Purple, Pink, Red and White. All with a medium mounded habit. VINCA catharanthus roseus Bees and butterfies love these plants! 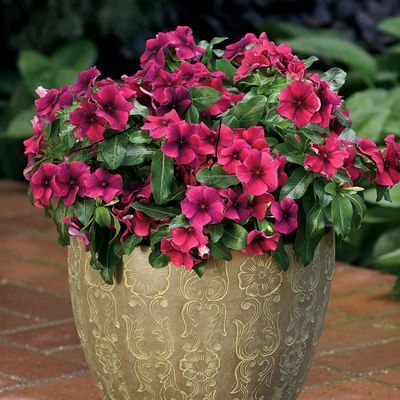 This hot summer survivor has impatiens-like blooms with silky petals cover compact, neat plants with glossy green foliage. 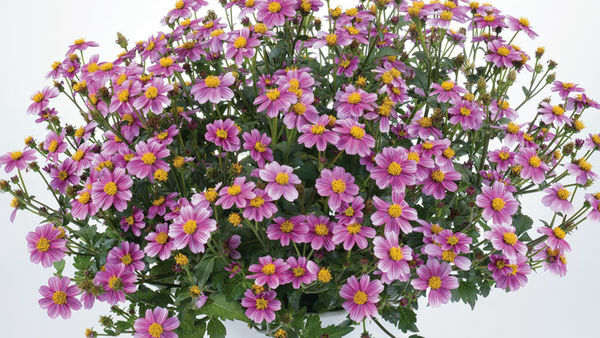 Very free-flowering, especially in hot, sunny locations. Do not overwater. H 10-14"
NEW! 'Tatoo Black Cherry' One of a kind color! Swirls of cherry and raspberry are lightly airbrushed with purple tones on large overlapping petals on a fully rounded form. VINCA major The well known Vinca vine found tumbling out of window boxes everywhere. Great foliage addition to mixed containers, trailing, 3-5'. Sun or shade. NEW! 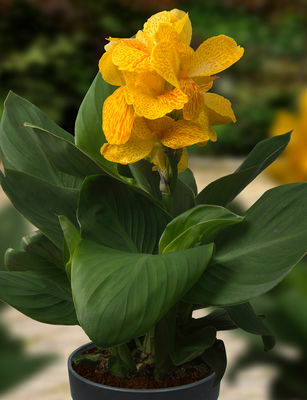 'Illumination' Trailing stems of bright yellow with green edges.